Are you looking to move your health and safety induction training away from the compliance ‘tick and flick’ and get it closer to its real purpose? Do you want to ensure your employees know how to work safely in their work environment? Do you want to encourage employees to seek help if they are experiencing mental health issues? At Tap Into Safety, we want to support your organisation to change the delivery of workplace health and safety training. We want to work alongside you to see the number of workplace injuries decrease, the mental health of employees improve, and take the stress out of delivering effective workplace training. Shaped by research, our unique software platform includes two workplace training solutions for physical and mental health hazards. These will complement your existing safety induction and can extend into your ongoing refresher and workplace training programs. We offer two workplace health and safety training solutions within one online platform. Our safety and mental health solutions include over 20 prebuilt modules,or our team of in house developers and designers can customise versions specific to your organisation. We use your organisations existing workplace health and safety data to build an individualised, interactive and immersive hazard perception training solution to complement your existing workplace training. Our cloud-based interactive training modules, written by recognised safety industry experts, can be completed in under 15 minutes and are available online and via smart devices. 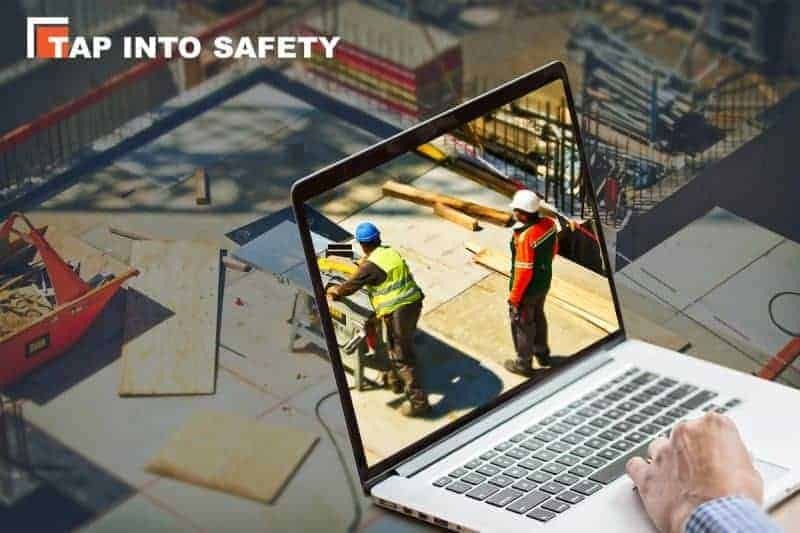 Through using 360-degree panoramic photography of your work spaces, our training solution allows your employees to interact with the gaming platform to determine if they have any gaps in their safety knowledge. This allows organisations to assess, measure and improve hazard perception through detailed results and reports. 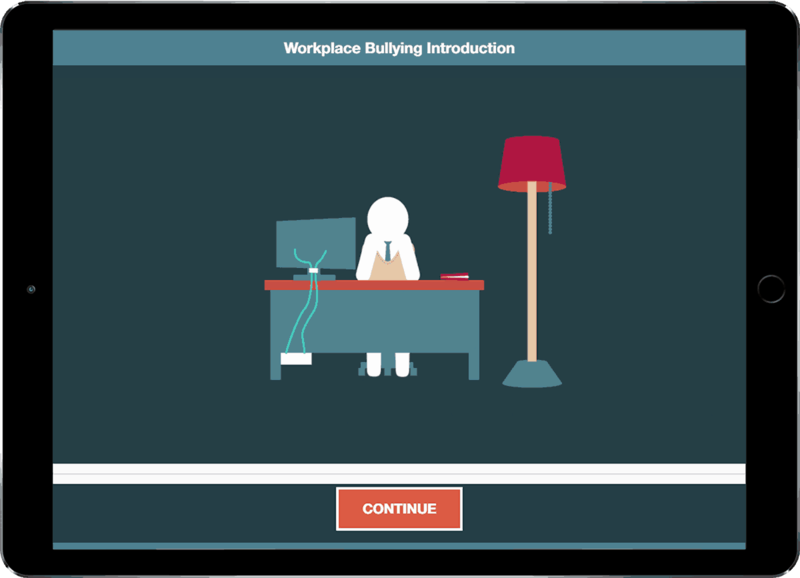 Our mental health training solution provides your organisation with animated customised scenarios of typical workplace issues that can impact on the mental health of your staff. The solution combines these scenarios with a personal and anonymous mental health quiz that assesses employees stress, anxiety and depression levels. 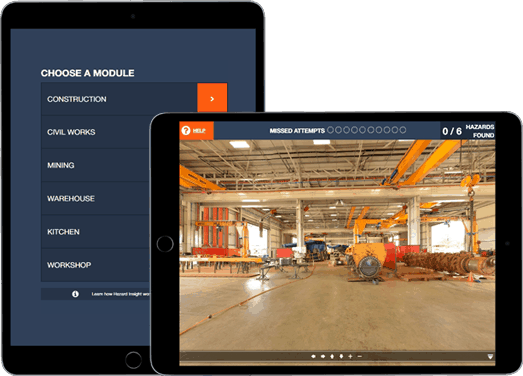 Developed using industry best practice and guided by industry experts, we have prebuilt modules that can seamlessly integrate with your safety induction and workplace training. We currently have 18 safety training modules and 10 mental health training modules. We are regularly adding new modules, but if you are looking for customised training please contact us to discuss.